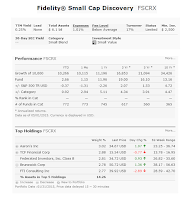 Fidelity Small Cap Discovery Fund (FSCRX) is a popular U.S. stock mutual fund. This Fidelity fund invests mainly in equity of small market capitalizations companies. The companies are similar to those companies with market capitalizations similar to companies in the Russell 2000 Index or the S&P SmallCap 600 Index. This domestic stock fund has a yield of 0.25%. Its expense fee is 1.01%. This fund has no sales load. The portfolio turnover rate is only 17%. With assets of $6.1 billion, the fund manager is Charles L. Myers. The top 5 stocks in its portfolio are Aaron's Inc, TCF Financial Corp, Federated Investors, Inc. Class B, Brunswick Corp, and FTI Consulting Inc. Top 3 sectors are financial services, industrials, and technology. Investing in this mutual fund involve risks. The investment risks are stock market risk, foreign market risk, small companies’ risk, interest rate risk, etc. 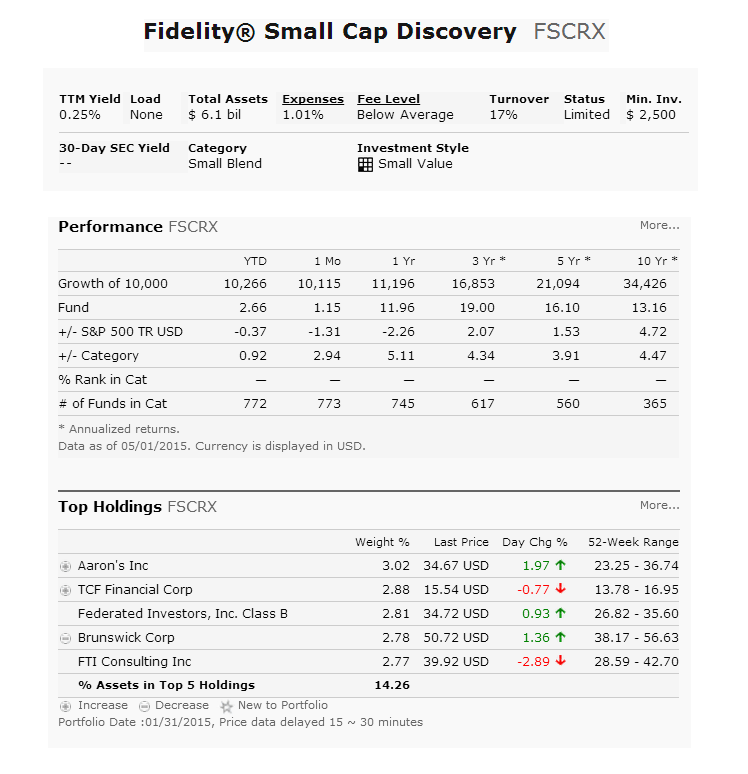 Fidelity Small Cap Discovery Fund has no sales load. The fund performance has been consistent for the past 5 years.